is in actual, this person must be counted in the "person of the century". this is not because he has played various positive roles in his Bollywood life but for the reason that he too followed those roles in real life too. it's not that he smashed the villains of real life but for the reason that he played the real role of humanity. 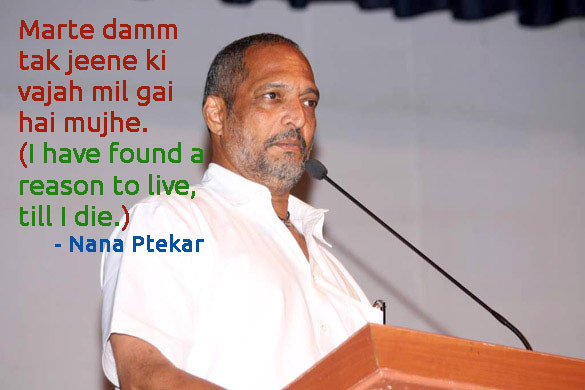 Yes call it irony or something more you conceive that very few people know about this phase of Nana Patekar's life. but don't get impatient after reading his inspiring story you will respect him more. 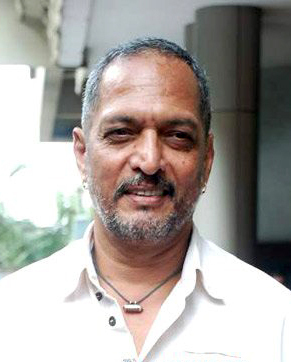 Nana Patekar is one of the most respected and multi talented actor in Bollywood (of course no doubt). But along side he is very kind hearted person, he cannot bear a poor person in pain, he understands the pain of the poor farmers and help them whole heartedly. he is a great philanthropist of ever who donates 90% of his earnings to poor people who are in need and he is doing so for more than 30 years. 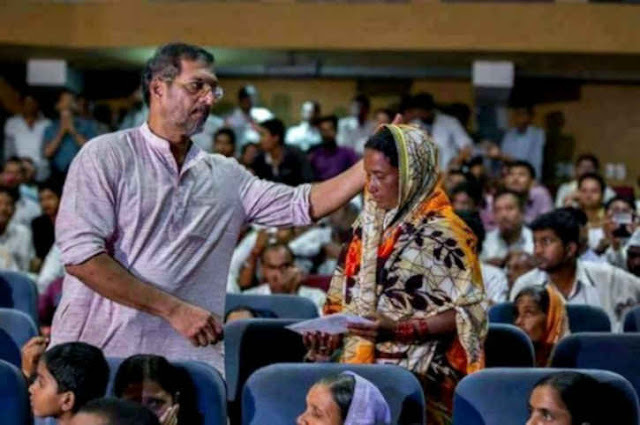 Now, since we know Nana Patekar is a great philanthropist but what makes him even more greater in humanity is his dedication towards what he is doing, In above picture you can see at an event held in small hall in Latur, Marathwada, organised to donate the cheques of Rs 1500 to the farmer widows. As Nana Patekar announced before. while this event took place, there was power failure for 5 minutes but who can stop a devote from Worship he then individually went to the seats of farmer widows to give them a cheque. 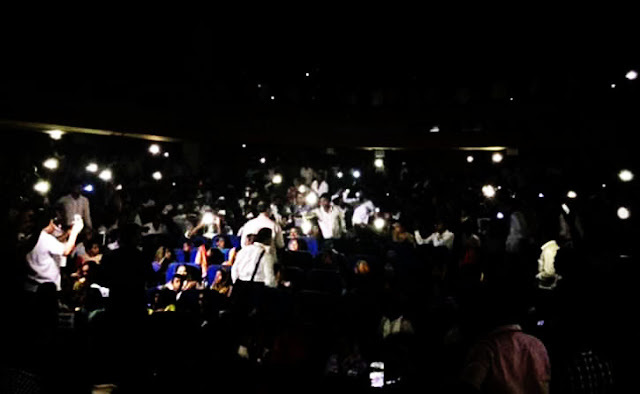 the people sitting around turned their torch in mobile phones so that Nana Patekar could continue his humanity deed. He has set a best inspirational message in a society. There are many facts about him which are unknown to most people. 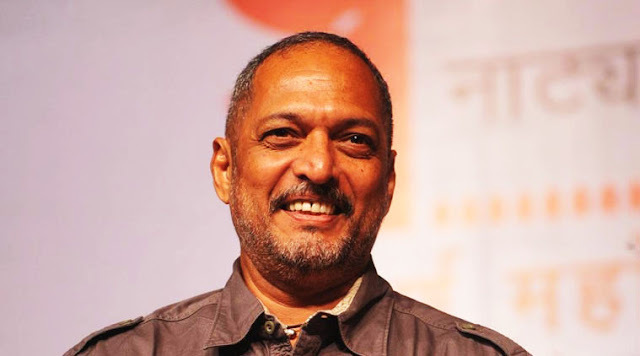 like, Nana Patekar can afford almost every luxury that current top Bollywood actors are with but inspite he choose to live a simple and common life. he live in a 1 BHK apartment with his family. 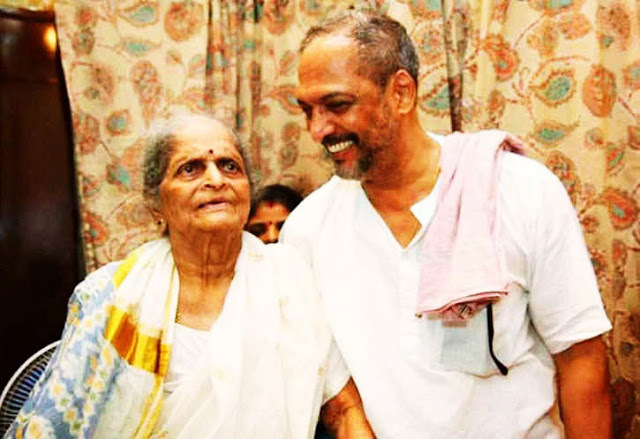 There are numerous humanity deeds that Nana Patekar did and is still on his to save the humanity, the very few facts we know about him are worth sharing so here are some great works of his inspiring life. because it gives me a reason to live. Bollywood should get real and do more. "Marte damm tak jeene ki vajah mil gai hai mujhe." 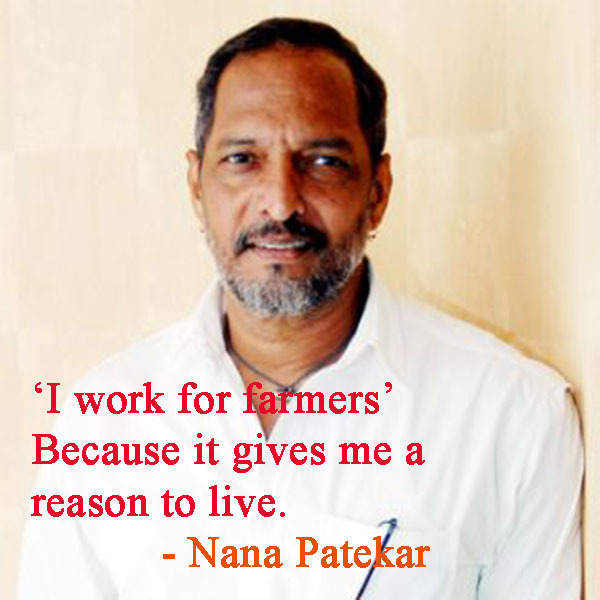 Despite being The Nana Patekar, he is the real person who do not care about what luxuries are, he is dedicated towards his nobal cause. says "helping the poor farmers, give me the reason to live". his life is truly a message for everyone. After knowing these valuable deeds of his life if you are willing to help him in his Nobel cause you can contact his organisation from their online website Naammh.org , or you can query online by searching Google.com.